← I Know Why You’re Here…..
Just returned from a five day visit to Philadelphia…a lovely city. A chance to visit with family and see grandchildren. Philadelphians are friendly and rather quiet. No one seems to honk their car horns the way Chicagoans do. But to me it’s all about the buildings. 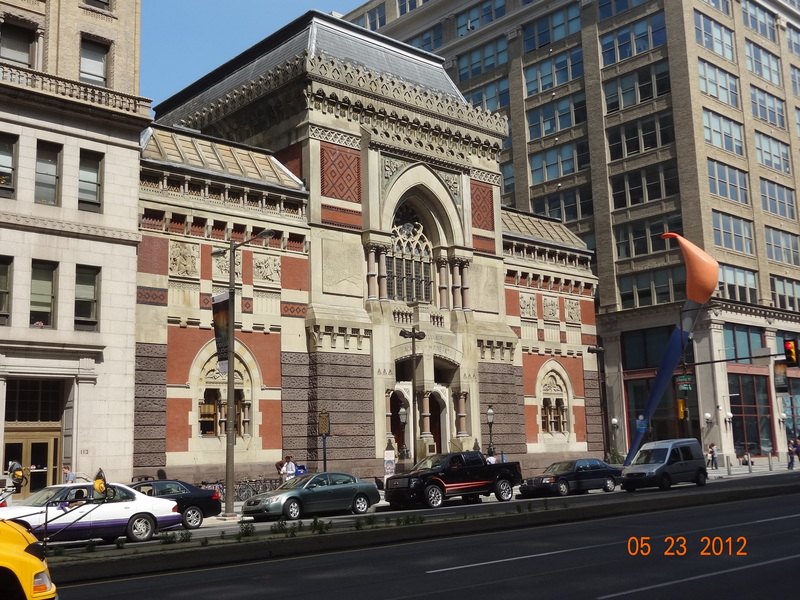 Philadelphia has a wonderful mix of old and new. Chicago has a tendency to rebuild every 30 years or so. When I look at a building in the Windy City it could very well be the 6th or 7th building on that sight. And then I wonder what was lost. While there I discovered a Chicago connection, of course. 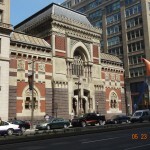 This is a picture of the Philadelphia Academy of Fine Art which was designed by Frank Furness. Louis Sullivan worked in his office for a brief period. He was laid off and moved to Chicago. Furness was known for his flamboyant Victorian style. Sullivan did admit he was influenced by Furness. decorative style. What do you think?